Add the flour one cup at a time until it is the texture of cake batter. There should not be lumps of flour. Mix in the finely chopped apples. You have to put the batter in a warm place to rise. Pour the batter in an oven proof bowl and cover it with a kitchen towel. Let it sit in a warm oven for 1 hour. It will about double in volume. In a large skillet, heat 3-4 Tbsp of oil over medium-low, medium heat. 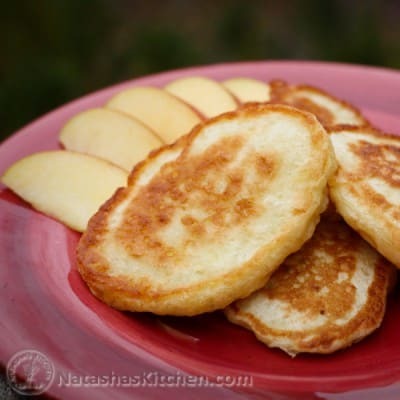 Place heaping Tbsp of dough onto the skillet and saute until golden brown, then turn over. You can get better shaped pancakes if you use a wet tablespoon to put the dough in the skillet and scrape it off with a teaspoon.